How Many Runners Did Jeff Nelson Pick Off Using the ‘Old Jeff Nelson’? Three things in life are certain: death, taxes, and Michael Kay making a reference to “the old Jeff Nelson” any time a pitcher fakes a pick-off throw to third in order to try to catch a sleeping runner on first. It’s a move Nelson attempted many times during his career, but it’s also one that doesn’t work very often. And so after seeing the move attempted a few times in recent weeks — including one attempt that resulted in Curtis Granderson getting tagged out to end a game against the Angels — it got us wondering, how many times did Nelson actually pick a runner off using the move? Believe it or not, the Elias Sports Bureau doesn’t keep track of Pick-offs Involving of the Old Jeff Nelson (we checked! ), and so lacking PITOJN data, we instead identified each of Nelson's four career pick-offs, and narrowed it down from there. Three of those pick-offs came while Nelson was with the Mariners — one in 1993, one in 2002, and one in 2005 — and none of those came with runners on first and third. But Nelson's one pick-off while with the Yankees — on May 1, 1996 in Baltimore — did come with runners on first and third. That Yankees-O's game was an epic one, lasting fifteen innings and more than five-and-a-half hours. 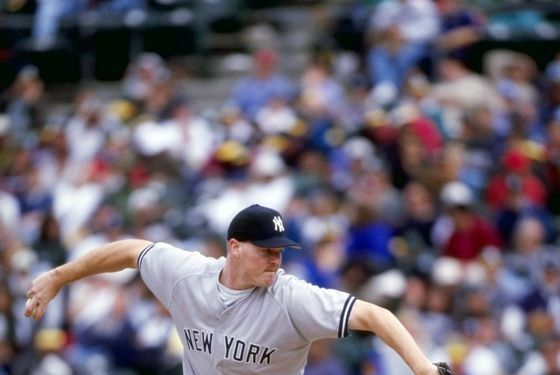 Nelson made just his tenth appearance as a Yankee that night, throwing a scoreless eighth inning to protect what at the time was a 6–5 Yankees lead. Fortunately, the Times' recap of the game is easily found on the paper's website. Unfortunately, it makes no reference to Nelson's pick-off of Manny Alexander to record the inning's first out. (Technically, Alexander was charged with a caught stealing because he tried to advance from first to second on the play.) And though there are a couple of other references to that game on the web, for some reason, they tend to focus on Tino Martinez's grand-slam in the top of the fifteenth, and not the middle reliever who picked off a runner in the eighth inning. And so the situation — runners on first and third — was right for Nelson to attempt the move, but did he? For that, we'd need video of the game. And after briefly poking around on the Internet's Yankees-broadcast trading market, we got in touch with MLB Productions, and secured a DVD of Nelson's appearance in the bottom of the eighth inning. Here's what happened: Bobby Bonilla led off the inning with a line-drive single to center. The next batter, Cal Ripken Jr., singled to right with Bonilla running, which gave the Orioles, who trailed by a run, first and third with nobody out. Baltimore manager Davey Johnson, hoping to score two runs to give his team a lead, sent in Manny Alexander to run for Ripken. Before throwing a pitch to the next batter, B.J. Surhoff, Nelson stepped off the rubber and turned to first, but did not make a throw. Nelson then stepped back on the rubber, came set, and lifted his left leg and made a throwing motion to third. But he didn't throw the ball, and Alexander, likely thinking Nelson was going home with the pitch, took off for second while Nelson, having stepped off the rubber, threw to Derek Jeter to apply the tag. Score it 1-6, and mark it down as the first and only out Nelson would record using the maneuver that would one day be named after him, at least on Yankees broadcasts. Speaking of which: Nelson says he's aware his name is used on YES any time a pitcher attempts the move. "Yeah, it's funny," he says, "because I know Michael Kay does it, and I get a lot of texts. And a lot of people that listen to the YES Network that are always saying, 'Well, your name was just mentioned.'" Nelson, by the way, says he probably tried the move a hundred times in his career. Half of the time, he says, his primary goal was to try to pick off a runner. The other half of the time, he says, he did it because he didn't have a good grip on the ball and didn't want to go to the plate, or did it to break the rhythm in much the same way that a hitter would step out of the batter's box. And Nelson — who says he didn't really like simply throwing to first base — remembers that he'd regularly try it with first and third and two out, since the runner on first would be preparing to run on the pitch. Says Nelson of the move: "It was one of those things where, if I could get an easy out, then I'm going to do it. If somebody's that stupid at first base, then I'm gonna get him."